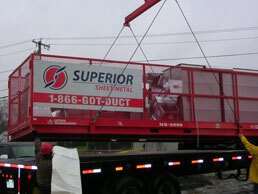 Superior Sheet Metal services and delivers to customers throughout New England. 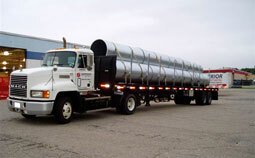 All of our delivery vehicles are covered, protecting your product from inclement weather. 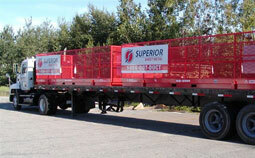 We also have two 20’ lifting baskets that we will deliver to the job site on our flat bed truck. The baskets leave covered by heavy tarps, again, protecting the product from the weather. These baskets are great for delivering product to upper floors and roofs – no more hauling up elevators and stairways. 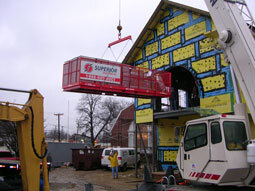 The baskets come with rigging providing a single pick point for crane lifting (crane provided by customer). The end of the basket swings open for ease of unloading. Load capacity for each basket is 2000 pounds. Superior Sheet Metal offers quick turn around on most jobs, and will assist in any way to accommodate those unforeseen circumstances that seem to arise. We will work with the job foreman to make sure the specific product needed at a certain time will be there. The job foreman will be provided with our nextel direct connect and cell numbers for instant communication with the shop. Superior Sheet Metal offer free quotations from customer generated cut sheets, or will provide computer generated quotes for entire projects from your plans. 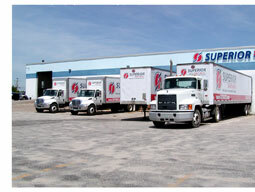 Plans may be emailed directly to estimating at sgoulet@superiorsm.com. Customer service is paramount to our business. We take pride in our efforts to insure the customers needs are satisfied.